Cyclists in the City: My Labour MP tells me it's my responsibility to keep away from danger when I'm on my bike. How am I supposed to do that when the Mayor is re-designing London roads to make it even harder to stay safe? My Labour MP tells me it's my responsibility to keep away from danger when I'm on my bike. How am I supposed to do that when the Mayor is re-designing London roads to make it even harder to stay safe? The Times's Cities fit for cycling campaign is going from strength to strength. On February 23, MPs will debate cycle safety for three hours. And if you haven't done so yet, do take two minutes to ask your MP to attend the debate by filling out this form. I'm at a slight loss how to interpret this response. On the one hand, good news she's listening. On the other, what's this statement where she says 'cyclists must not put themselves in danger' all about? Let's look at one example. Pictured above, the A13 in London at the entrance to the Blackwall Tunnel, a main route into the City of London from east London. The picture shows the road layout as it used to be. Have a look at the video below (or click here to view) which shows the exact same junction now that is has been redesigned by London's supposedly cycle-friendly Mayor. This new road layout was finished a couple of weeks ago, part of Boris Johnson's scheme to revise London's junctions to make traffic flow more 'smoothly'. This new Boris-designed junction is frankly terrifying. Where once you could cycle in relative safety in the bus lane, now you have to swing into the second lane of four, a lane in which motor vehicles will be turning left in front of you at high speed as you pedal frantically straight ahead. It's unbelievably lethal. 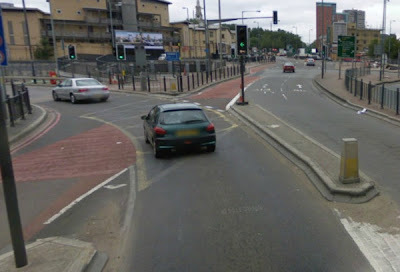 As one commentator says: "I seriously fear for my life and other cyclists' lives on this junction." What's more, the bus lane has gone and notice just how much space there is beside the road for a decent Dutch-style bike track to run alongside. My question to Kate Hoey MP is whether she genuinely understands the implication of her statement that cyclists should 'clearly understand their environment and not put themselves in danger'. I would like Ms Hoey to realise that London's Mayor has implemented road policies that put Londoners in danger when they are on bikes. The same is happening all over the country. What I want to know is what Kate Hoey proposes to do about it, not have a lecture about my ability to read road conditions. Her statement is insulting and utterly misses the point that The Times is making. My concern is that Kate Hoey interprets the Cities fit for cycling campaign as a campaign to tell people to cycle more safely. That's only part of the message. The bulk of it is that the way our streets are designed and policed has to change. I hope she realises how little she has understood of the issues that are being discussed and debated in the media and that she changes her position before the debate in the Commons on February 23 but I doubt she will. In fact, I doubt she wants me to use a bike at all. Back in 2010, Kate Hoey was vocal in trying to ban people cycling along London's South Bank - an off-road family and leisure bike route.It seems she doesn't want bikes to mix with cars but she also doesn't want bikes to get safe alternatives either. What's it to be? Shall we all take to our cars, Ms Hoey? I think your concern is well-founded. Having had corespondence with Kate Hoey a couple of times before, on the Thames Path around Waterloo, I had the impression she was really only paying lip-service, so I don't have high expectations of her. I am sure that many of the political or public figures who have signed up for the Times campaign have done so with a highly selective take on the eight points in the manifesto. Mainly it seems to the ones to do with training (cyclists) and education (of drivers) rather than the concrete proposals or those which involve money. And it strikes me that quite a few others are of the "wits about you" brigade who believe that all people need is confidence. Is that all bad? Well,no - you have to start somewhere and simply getting acknowledgement that cyclists are a vulnerable group is an advance on where many onlookers to the campaign probably are now. Politicians won't move on this unless they feel there is a wider backing for it and this could get that started. I seem to recall that Dutch cycling was on its way to hell in a handbasket back in the 70s, until the "Stop der Kindermoord" campaign influenced wider publc attitudes and fostered the environment which made serious investment in cycle infrastructure possible. As you probably know, you will get far further with MP Hoey if you drive a cheeky '60's style Mini. After all, how else could anyone possibly travel from Vauxhall to Westminster? Looked at from this end of a computer screen, I would simply say "don't do it". Life is too precious to take the sorts of risks that a road like that is offering. Politiicans need to be persuaded that a future with far less car journeys can and must be planned for. Roads like that have got to be rebuilt for the benefit of all traffic. Even the remaining cars will be happier. Ms. Hoey has form. Well before the Thames Path episode. She wrote a feature article in the Daily Mail complaining about how terrible cyclists were a few years back. Frankly, I don't see how a debate in the House of Commons is going to be much good. Are we seriously expecting MPs who have never really accepted just how dangerous to others their (and their constituents')motoring can be to suddenly see how wrong they have been because of The Times campaign? Safety on the road is a political and moral issue. It involves specifiying who and what is at fault before doing anything about them/it. So the likes of Ms. Hoey can say: "Yeah, OK there may be some bad motoring/highway layouts but it's down to the naughty cyclists". The Times campaign - such as it is - is not going to change that. Hoey is profoundly and consistently anti-cycling, full-stop. A few years ago she wrote an article in the Daily Mail complaining about the "abuse" she receives when she beeps her horn at cyclists cycling on the road when there's a cycle path nearby. Just imagine! You use your motorvehicle, in blatent contravention of the Highway Code, to bully and intimidate other road users peacefully and legally going about their business, and the bastards have the nerve to object to it! How dare they! Disgraceful behaviour from an MP (though it's not like Members of Parliament aren't famed for breaking the law). I wonder how many of us need to use the phrase "Self-confessed criminal Kate Hooey" before it becomes synonymous with her name? Even as a regular cyclist, I believe Kate Hoey was right to raise the issue of cycling on the Bank as a concern, as it has been raised time and time again by pedestrian users as intimidating and an inappropriate use of the space, particularly in the bottle necks around the Oxo Tower and the County Hall. However, it is clear that there are some terrible junctions out there which desperately need improvement, and I fully support the Times' campaign. That response is frankly rather pathetic and short sighted. Yet another MP who clearly doesn't understand where the danger lies on the roads. Unfortunately I think it's going to take more then a very well meaning campaign by a national newspaper to undo the decades of rot that have given us this road infrastructure that panders to the most dangerous users and the utterly disgusting attitude that a small (but ever growing) minority of drivers show towards cyclists. well, a year ago, southwark council's transport plan was all about cyclist training, even, and i am not kidding, 'pedestrian training' (which irresistibly conjured up images of people without training falling over each other, stopping at random points on pavements/in spaces unsure what to do next etc). I trust by now you must have heard of The Times' "Cities fit for cycling" campaign. I hope you will support this campaign, if you have not already done so. The benefits of cycling are numerous, improving health, reducing congestion and pollution, increasing footfall for local shops, providing children with independent transport, etc. However, it has to be safe to cycle for people to take up cycling in any meaningful numbers. This is particularly a problem in Brent, where the latest Transport Plan showed only relatively wealthy white men were cycling, in low numbers, at the exclusion of everybody else. This is despite Brent being relatively compact, with many local jobs and schools and close to central London. Many more trips could be made by bike here, if only it was safe. The current layout of cycle lanes is, at best, woefully inadequate, when it is not absent altogether. Supporting the Times' campaign, as well as the London Cycling Campaign "Go Dutch" campaign, would help putting pressure of the authorities responsible to put in appropriate infrastructure. Brent, with its network of parks, schools, libraries, and connections to the West End, could be an amazing place to cycle in. Please help us make this happen. I also note there will be a debate on cycle safety in Parliament on 23 February, I do hope you will be able to attend and put forward the advantages of proper cycling infrastructure not only in Brent and London, but the rest of the country as well. Result - the lethal road layout seen in the video. "...understand their environments and not put themselves in danger." = Keep off the road! "...lists some interesting proposals" = I can agree with a point or two on the list, and ignore all those that would require to actually change or do something. ...As you are already aware, the Times are running a campaign to see road safety improved for cyclists. I have read through the campaign asks in detail but have some concerns about their practical workings and their economic implications. I appreciate that in many respects one cannot put a price on accident prevention if lives are saved. However it is the job of government to balance the sometimes competing needs of all road users and to find a workable medium between safety, enforceability and what is desired by the public. Without a better understanding of the implications, therefore, I am afraid I am reluctant to give the aims of the campaign my wholehearted support. If Mark Field wants help working through the economic implications (as opposed to the simple human costs of so many casualties), he could refer to the Department for Transport's official statistics on the costs to society as a whole of deaths and injuries on the roads. Going by DfT's figures the total cost of all the cycling casualties in Britain in 2010 was around £850 million. If the Times is right that cycling casualty rates are three times higher in the UK than in the Netherlands then it seems like we might be able to save around half a billion pounds a year by making our roads as safe as theirs. It's hard to believe the costs of such safety improvements could outweigh such huge benefits. The Times cycle campaign is no more than a childish wish list of demands - "I want, I want, I want". How about cyclists start contributing to the cost of maintaining the roads and stop bleating about how they are not configured to suit cyclists. How about anonymous morons grow some and stop trolling. How about cyclists start being constructive rather than holding onto this crass attitude that either you are with us or against us. And that just proves you're a troll. Deliberately ignore the facts in the blog, and the past info where these guys have actively campaigned for sharing the road. Also you're deliberately ignoring how the roads are actually paid for. Is Downfader your real name & is that a real picture of u? Don't understand why my comments are less worthy because I don't agree with your "so-called" facts. The facts - motorists contribute £48 billion in tax & only £9 billion is spent on the roads. People whilst cycling contribute nada despite having cycle lanes & taking up vital space. Cycling is important but it is about time cyclists started paying their way. Some recognition that there are bad cyclists out there as well would be nice. Cyclists do pay their way. If we were to reflect the real costs of motoring the motorist would have to pay double in tax to fix the mess motoring causes the UK taxpayer. £48bn doesnt cut it. Ok so 9 is spent on the roads..? Each road death costs the NHS and Police £2 million to deal with. The NHS is dealing with 200,000 injuries a year related to the roads. An average of 2500 of these are deaths involved with the motor vehicle. There are environmental costs too. I'm not going to address the carbon footprint, but the water, soil and air pollution from nitrates, nitrites, sulphates and other carcinogenic particulates is estimated to cost £20bn a year to clean up. Thats a cost of £58.5 billion a year so far. I haven't touched on pavement and other illegal parking and the money councils have to spend on that. Or indeed the carbon dioxide costs. The costs to repair speed cameras and traffic signs after vandalism. Each time we look at the impact motor vehicles have on society another cost is flagged up. THAT is why you're comments are less worthy. You must be stark raving mad to suggest people driving has a negative impact on the economy. Surely you realise you are putting up a completely false argument? The advent of the motor vehicle has made the UK far wealthier (as you surely know). The total police budget is £4.8 billion (England & Wales) & you say £3 billion is spent policing traffic offences (pull the other one). I can't be bothered to knock down each of your arguments because either you are joking or simply deluded. I don't understand how cyclists pay their way unless they are also drivers (as many are). Hardly any surprise that you wish to remain anonymous - you answer reasoned responses with abuse and a highly selective and twisted presentation of your "facts". Fact: roads, like everything else apart from the BBC, is paid from general taxation. Winston Churchill in the 1930s dispensed with motoring related taxes because of precisely teh problem you represent - that motorists will start to think they own the roads. Fact: 83% of all adult cyclists also own cars and so also pay motoring related taxes. In fact, the incidence of car ownership is higher among cyclists than non-cyclists. Fact: as a demographic, cyclists, especially urban ones, come from the higher-earning part of society - just take a look at the number of bankers, lawyers, accountants, brokers etc who pedal into the City of London every day. They pay a lot of income tax, NIC, VAT on their expenditure etc. I'll lay odds that I pay a good ten times as much tax each year as"Anonymous" does. Fact: the amount of road maintenance needed as a result of bicycle wear and tear is infinitesmal compared with that caused by a car, which in turn is consiuderably less than that caused by a HGV. Fact: the wealth or affluence (different things) of the UK may indeed have been enhanced by motor vehicles but it is not so easy to say that our wealth would not have been even grtaer without them. The Dutch and the Danes enjoy a larger per-capita GDP than the British do - around half of Dutch people commute by bicycle and the Danes are not far behind, while bare 2-3% of Brits do the same. Never argue with an idiot, they just drag you down to their level. First of all your definition of a troll appears to be someone that disagrees with you and well done on your massive tax bill your opinion obviously counts for more as I am obviously not as rich as you. Secondly I haven't dished out any "abuse" but have been on the receiving end of some (boo hoo). How can you seriously argue that the costs of the roads comes out of general taxation when motoring taxes pay for the roads many times over (even if it does come out of the central pot). Of course there are external costs (accidents/environment) but there are also far more significant economic benefits. Using 1 of your figures - 1 in 6 cyclists does not contribute anything in motoring taxes. Cyclists in the Times cycle campaign are calling for hundreds of junctions to be redesigned = costs. Maintaining and building cycle lanes = costs. Holland and Denmark are tiny by comparison to the UK and flat. You are not comparing like with like as you are well aware. What's frustrating is that me and much of the political elite broadly support the Times campaign but cyclists continue to act like a persecuted minority. Political opinion is on your side stop behaving like a lynch mob. Start talking to other people and go easy on Kate Hoey. She's not the scum of the earth out to murder cyclists as some of your peers suggest. A proportional and rational response would be welcome in relation to the wider debate on cycle safety. I shall now leave you to talk amongst yourselves and no doubt resume the name calling. You do realise that repeating strawmen ad infinitum does not make a counter to a series of points people have made. THIS is the reason you were called a troll, and I stand by that. Compulsory cycle test - is it your intention to kill off cycling in the UK. The beautiful thing about cycling is that it is free - putting any form of compulsion removes the mobility of the disenfranchised - if they cannot move freely then they will more likely remain on benefits. You're right, Holland and Denmark have a few differences. However it is the similarities that are encouraging (similar network of roads, similar economy, people with similar interests). So what, they're flatter - but a Dutchman once told me the headwinds are a nightmare, especially further out to the coast. We have hills, and they aren't even big hills. Why bother with ID badges? They'll be too small to be seen, plus all the evidence (eg as the Toronto investigation concluded 10 years ago) shows its cheaper and more productive to get the cops on the ground in the first place. You've really failed to disproved mine or anyone else's comment. The new layout looks like a motorway. Is it any wonder it's being treated like one in the video? Fast and with motorists desperate to find their exit any cyclist could get caught out there. It certainly doesn't look conducive towards getting kids to cycle, or employees. A further problem that I can see in the video also include cyclists being masked by high-sided vehicles on the approach to the bend and the lights. Road safety is a responsibility for us all, whatever MP Kate Hoey said. There may be some cyclists with suicidal tendencies around, but they're surely a minority, a fact Kate Hoey may not be aware of. Whether driving a car or riding my bike, it's my duty to allow others get to their destination safely, while I hope they'll reciprocate. And it is the government's duty to create the infrastructure that'll allow just that. It's a win-win situation: the more cyclists there are on the road, the more space there'll be available to the remaining motorists. I hope that on my next visit to London, I'll feel safe enough to use a bicycle, as I'm one of those pampered Dutch, living in a 30 Km zone, with segregated cycle-paths, and plenty of 50 Km zones with motorists who don't feel the need to kill me. Kate Hoey's my MP and you can tell she's in a safe seat. I don't think she really gives a damn about cycling or us cyclists in Vauxhall, home to the Vauxhall Gyratory Racetrack... and a total mess after years of Labour rule nationally and locally. Kate Hoey is my MP too, and as Gavin says the seat is very, very safe. Beelzebub himself could stand for election, and as long as he was the Labour candidate he'd win by a landslide! The thing that annoys me about her attitude to bikes is that she doesn't want them on the road, she doesn't want them on the path... Where should they go? I'm sure she just wishes they didn't exist. Bikes really are a third category of transport, but UK street design only seems to recognise two - motor traffic and pedestrians - as worth investing in. Cycling is treated like an unwanted stepchild, not good enough to spend money on infrastructure for. Perhaps there should be a bike strike! If all London cyclists abstained for one day, there would be chaos on the roads, the buses would be full and there would be long queues for the tube. Maybe then cycling would be taken seriously, once people saw life without bikes!